This is a great summer craft activity for youth ministry. If you use this idea, then please become a Support Partner first. Click here! What You Need: 85 burnt-tipped matches to make one cross (burn the match tips before class time. I separated mine into three batches, placed them in a stainless steel sink, laid the tips side-by-side and then lit them. ); Tacky glue; 8.5" x 11" card board or chip board; pencil; scissors. Gospel In a Nutshell Bible Lessons. Step One: Draw a 2" vertical line and an intersecting horizontal line slightly above the center of your board. Cut off the tips of two matches. Cut both matches in half. Glue to the horizontal and vertical line. 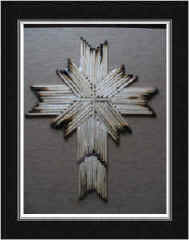 Step Two: Place a thin layer of glue around cross to make an "X" (approximately 1 1/4" wide and the length of the matches). With burnt tips facing out, lay seven matches side-by-side into the glue in all four corners. Step Three: Place a thin layer of glue on the board for the top of the cross (approximately 2" wide). With burnt tips facing out, lay eleven matches side-by-side into the glue. Do the same on the sides and bottom of the cross. Step Four: Place one more row of eleven matches on the bottom of the cross to finish it off. Allow glue to dry, then frame it. If you use this idea, then please become a Support Partner! Click here.